Rayman Legends will be jumping to the Wii U within the console's launch window. The follow-up to Rayman Origins was originally slated to be a Wii U launch title, but in October Ubisoft crushed the hopes of early hardware adopters by delaying Rayman Legends to the vague first quarter of 2013. It appears that Legends will indeed make it to stores during the Wii U's launch window; Ubisoft has just announced that the console exclusive will be released on February 26, 2013. European gamers will have to wait just a little longer to experience the next adventure of the limbless hero. Rayman Legends is scheduled to be released in the UK on March 1, 2013. A demo for the game will be available on the Nintendo eShop worldwide next week on December 13. Rayman Legends builds on Origins' co-op platforming by utilizing the Wii U's GamePad controller for asynchronous gameplay, allowing one player to use a green bug to interact with the environment to help (or hinder) the other players. 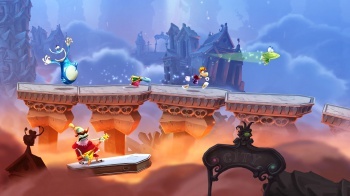 Unlike the multiplatform Origins, Rayman Legends was developed exclusively for the Wii U. While it was a bit disappointing to see it pushed back into 2013, hopefully the extra time allowed the development team to create a worthy sequel to the favorably reviewed Rayman Origins.